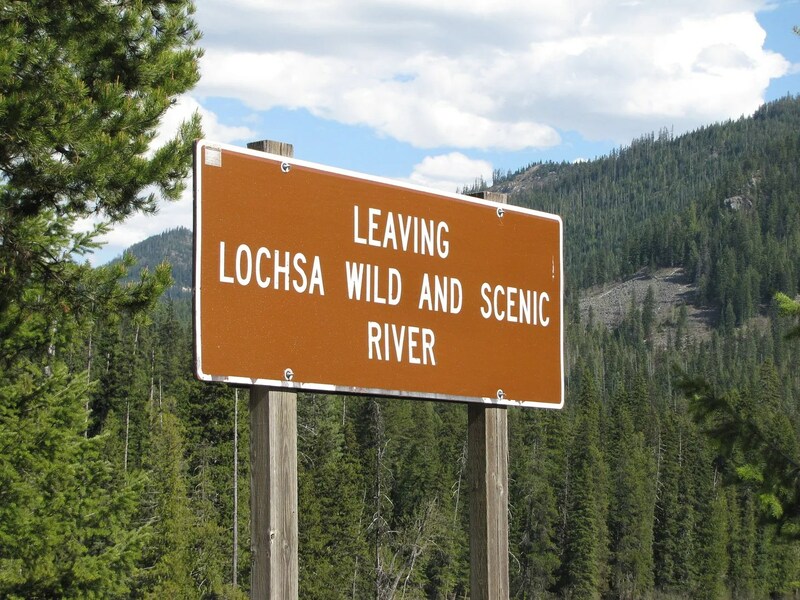 We continued driving along the beautiful Lochsa River. We didn’t see any more whitewater rafters, but it had been so wonderful seeing the ones we did see and participating in their excitement that we were still on a whitewater high. 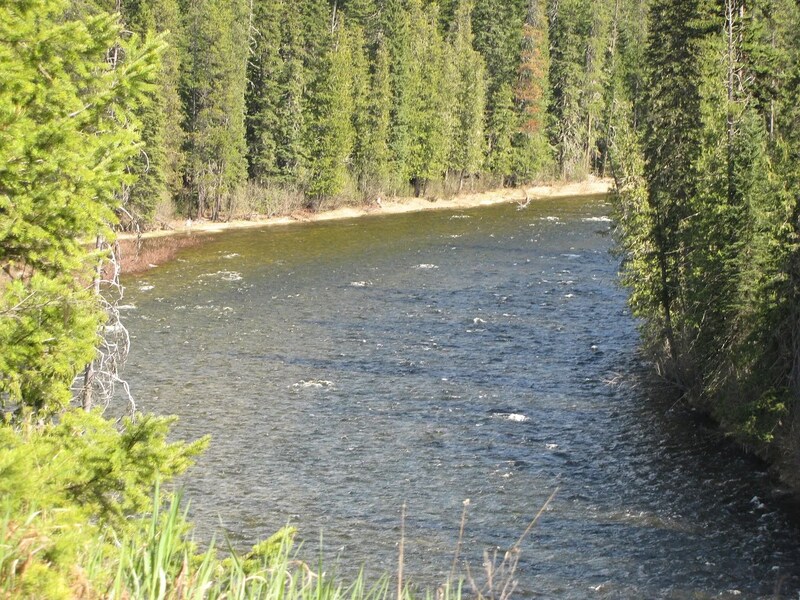 It’s hard to describe our awe at how this lovely river just went on and on. I tried to imagine what it was like for Lewis and Clark; they probably weren’t quite as excited as I was, but I bet they appreciated its beauty. 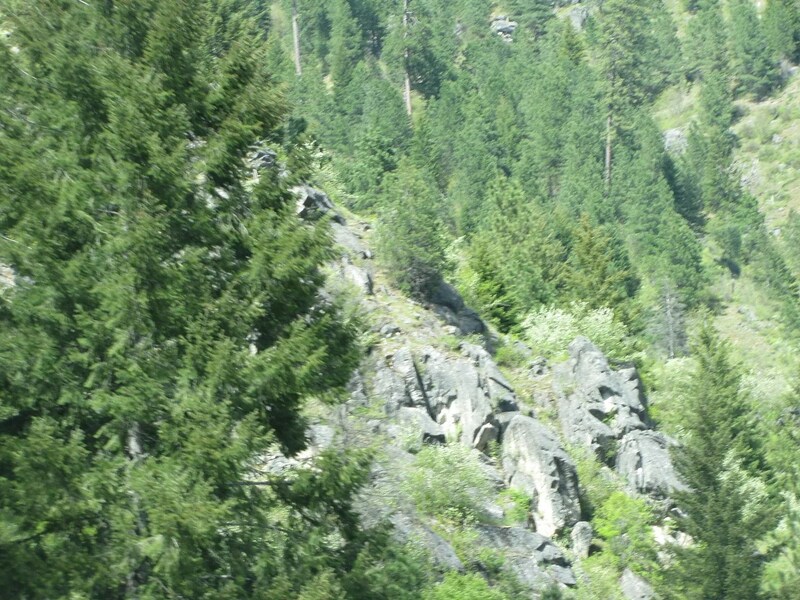 There were lots of interesting rock formations alongside the road. This still cracks me up. I should have been wearing my “lolo” shirt. 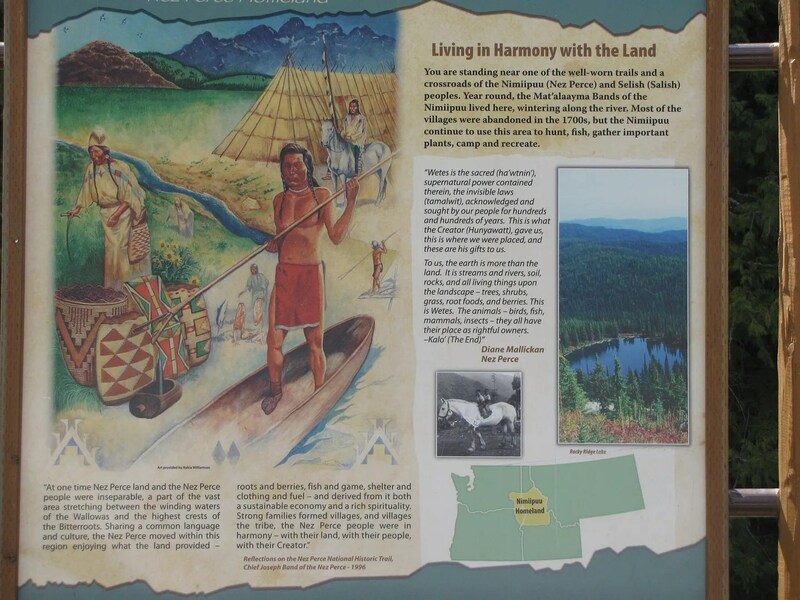 “Are you thinking about following in the footsteps of Lewis and Clark? 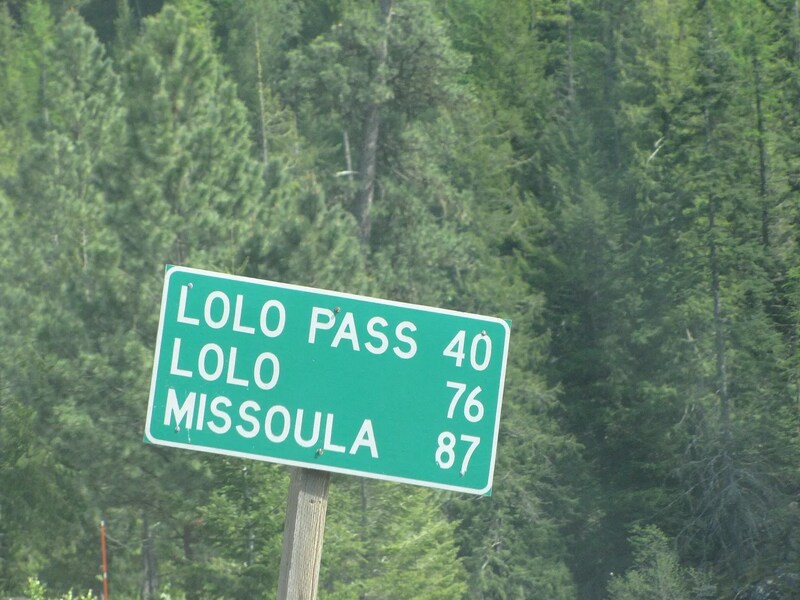 If so, you will be driving the Lolo Motorway, Road 500. 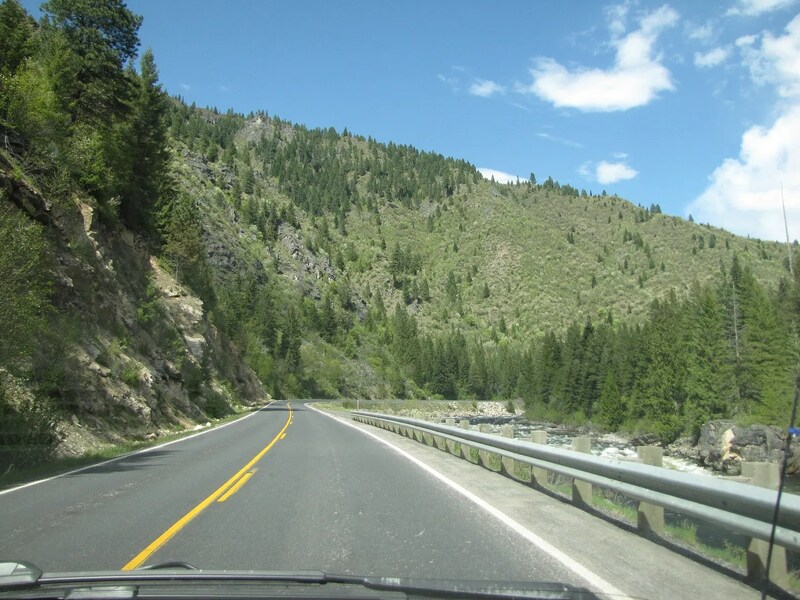 It is a narrow, rugged road with rustic lookouts and a backdrop of spectacular vistas. 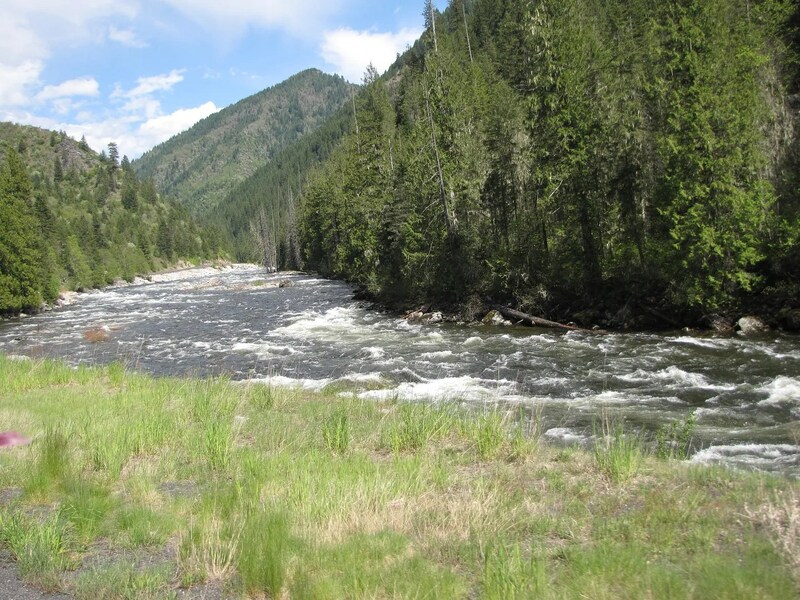 This landscape is much the same today as when Lewis and Clark viewed these mountains in 1805 and 1806. Be prepared!! Do not let the term “motorway” fool you. 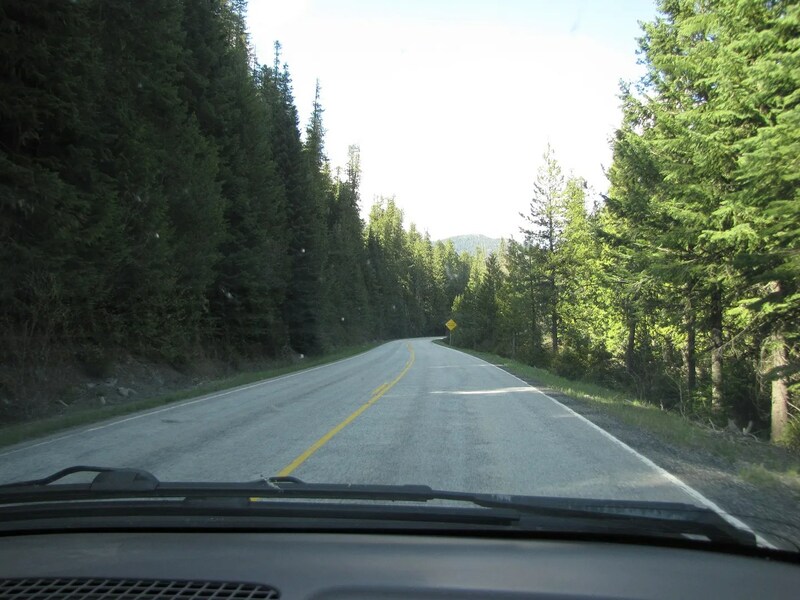 It is an old-fashioned term from early days of automobile travel when people did not take taxi drives; they “motored”. 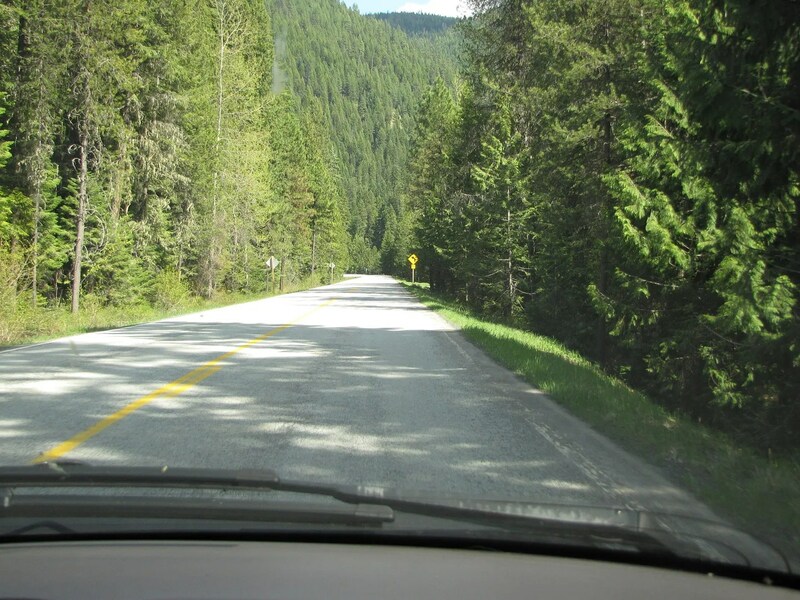 The Motorway is a single-lane dirt road with steep drop-offs. 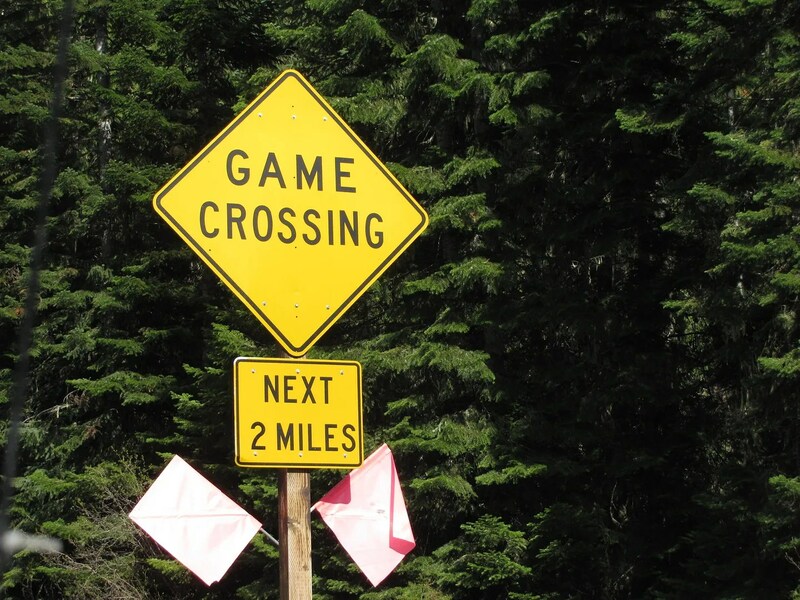 You may need to back up long distances to find suitable places to pass. Towing trailers is strongly discouraged. 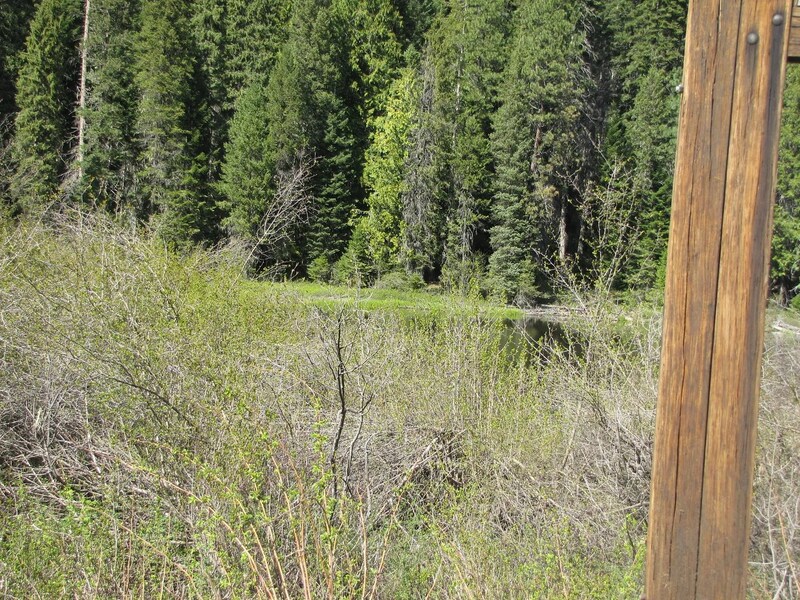 The sign talks about the Nez Perce peoples, who used to live here but still use the land for hunting and fishing. “My name is K’useyneisskit. I am the trail to the buffalo. 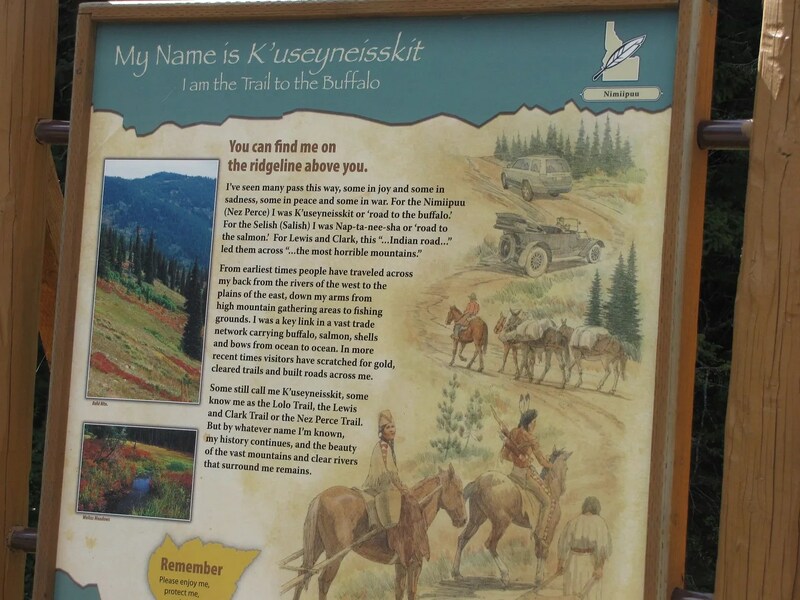 For the Nizniipu (Nez Perce), I was K’useyneisskit, or “road to the buffalo”. 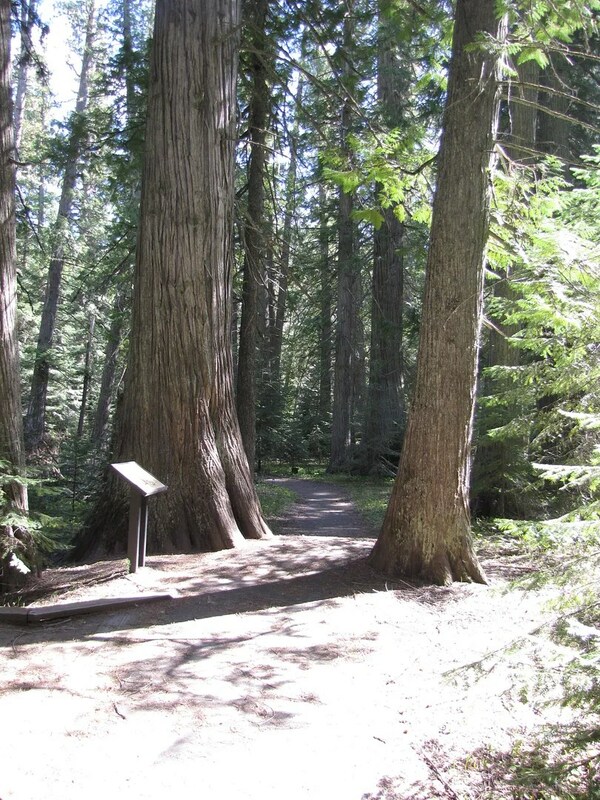 For the Selish (Salish) I was Natp-ta-nee-sha, or “road to the salmon”. 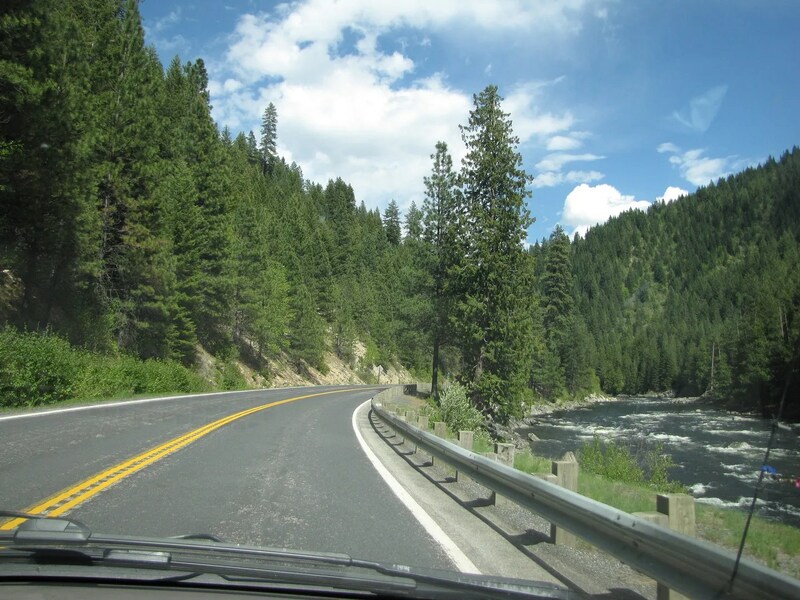 For Lewis and Clark, this “…Indian road…” led the across “…the most horrible mountains”. I guess Lewis and Clark didn’t like it much! But really, who can blame them? 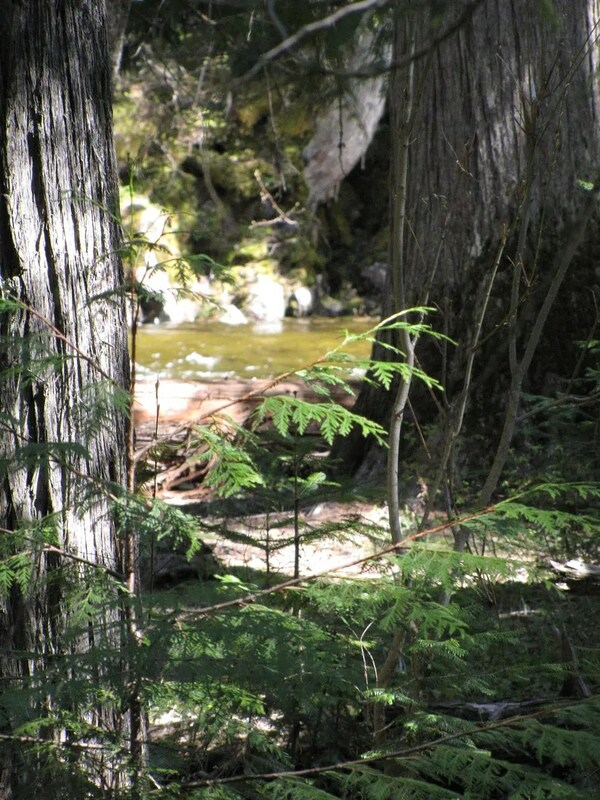 There they were, on foot and canoes, trying to navigate their way over the thickly forested mountains, unused to them. Not like the Indians. Back on the road again. Sometime I’d love to go back and just wander around this area. 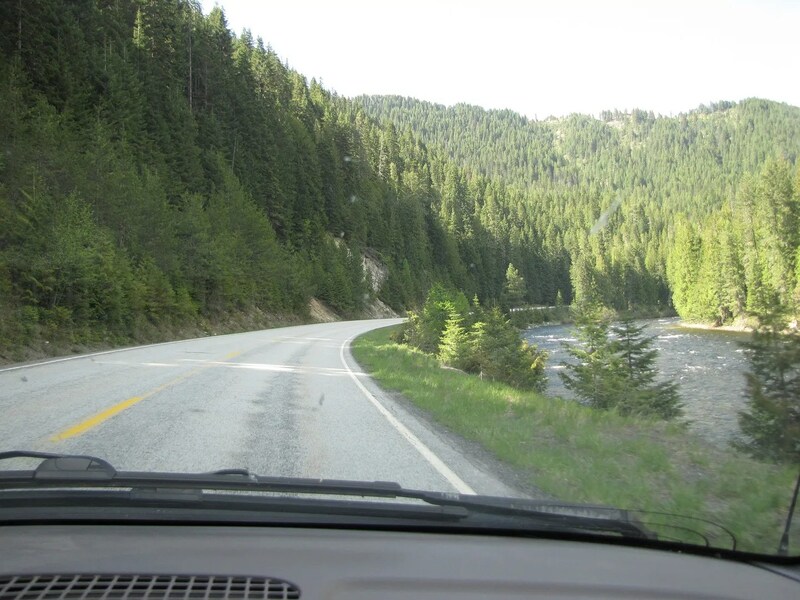 We’ve moved away from the river, and are now climbing towards Lolo Pass, which marks the state boundary between Idaho and Montana. Try look! The pavement is now much lighter. I wonder why. One minute dark, the next, light. I like the light better. Still climbing. Can you imagine all the early peoples trying make a pathway through this kind of landscape? 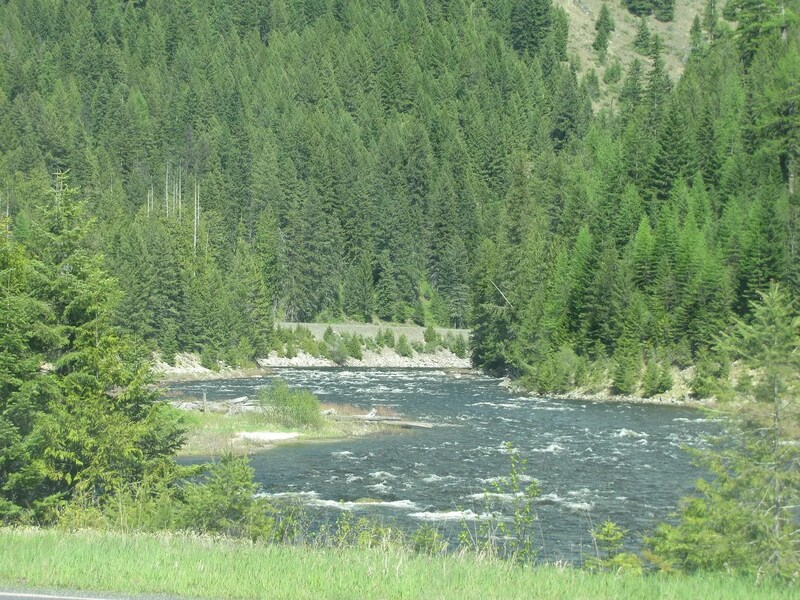 But here’s the river again, our ever-present companion. 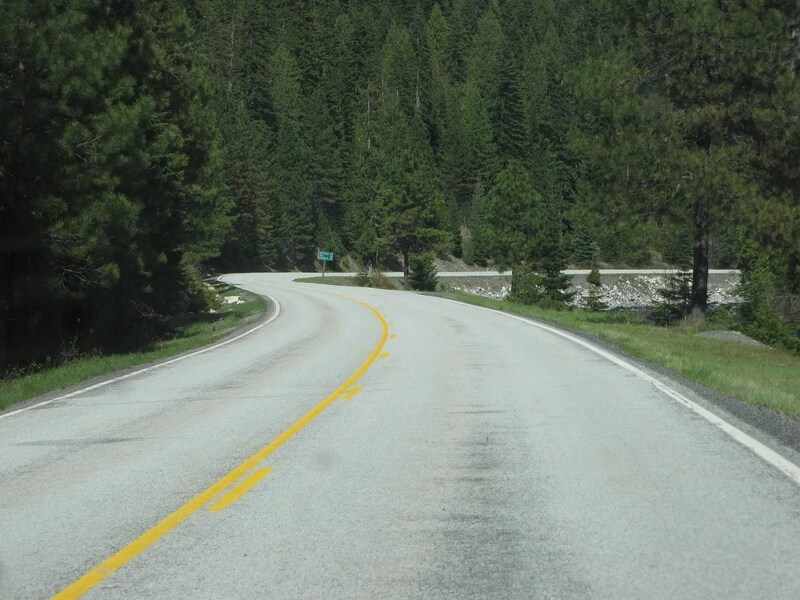 Nolemana doesn’t understand it, and I’m not sure I do either…but I love the look of a curvy road in front of me. It’s visually very pleasing to me. 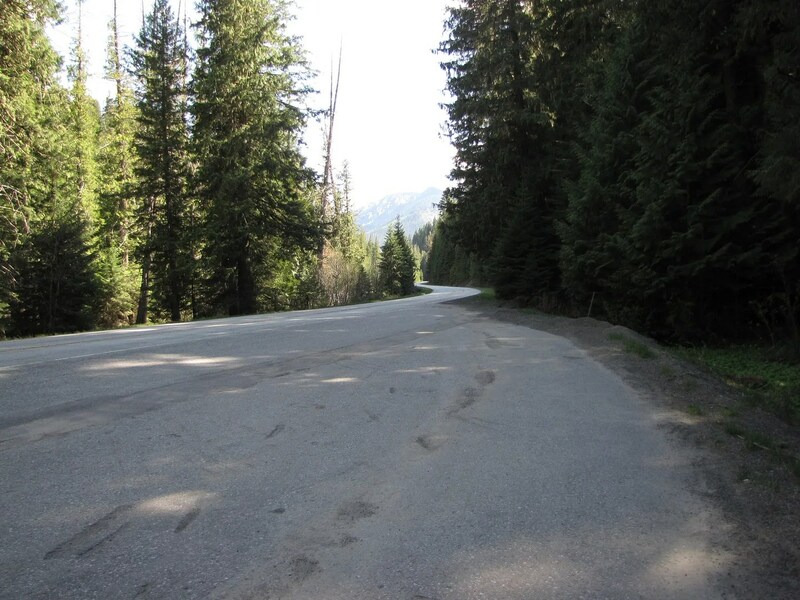 Twenty more miles to the summit…and Montana! 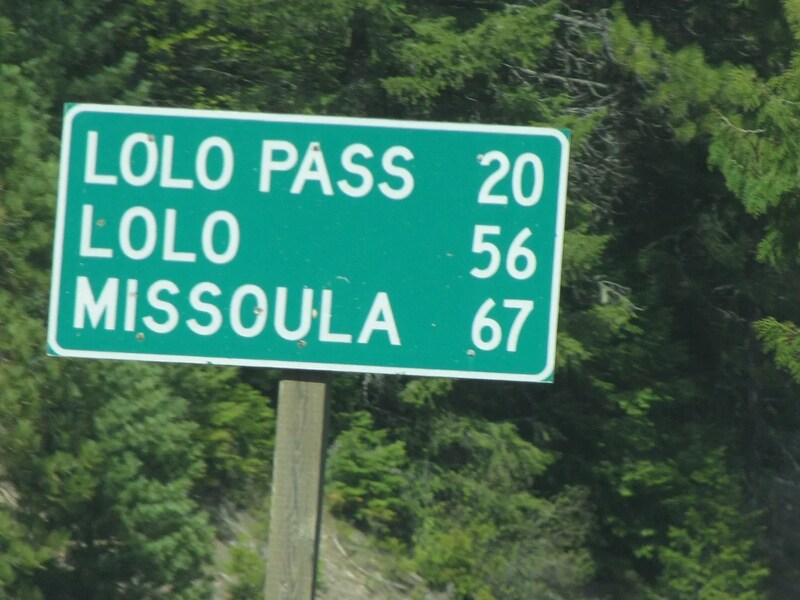 I wonder if there are any lolos living in Lolo near Lolo Pass. Wow. 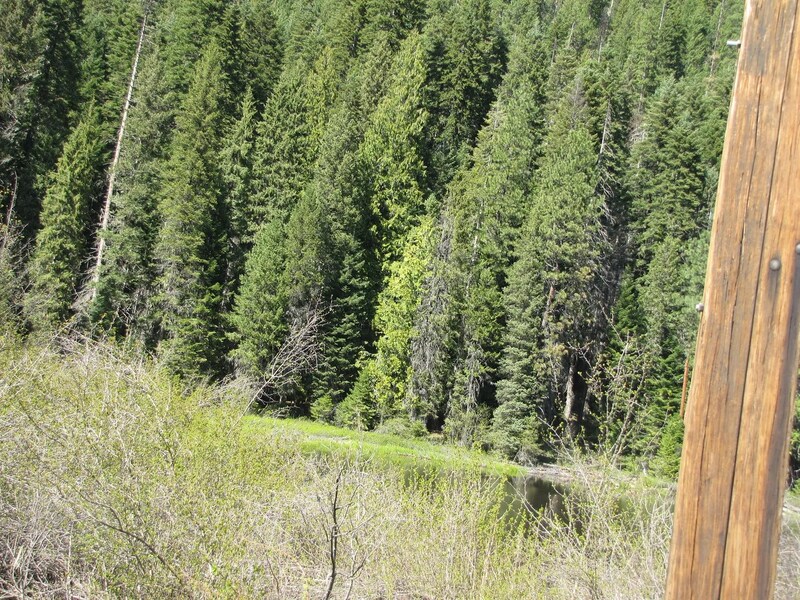 Lewis and Clark crossed right here!! My ancestor (Clark), and now here I am. 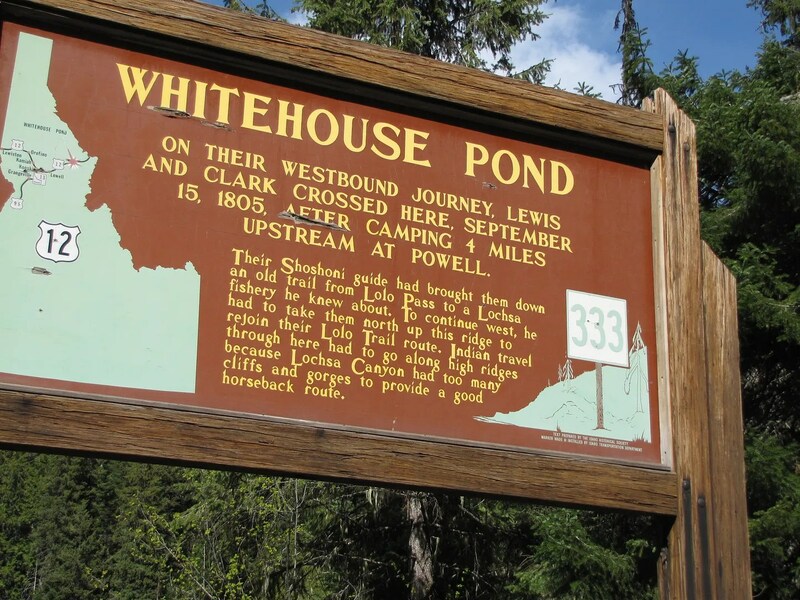 Whitehouse Pond. Oh eh. Try wait. I wen marry one kane with da lass name White. I even get towels dat say, “White House” on ’em. How lolo is dat! 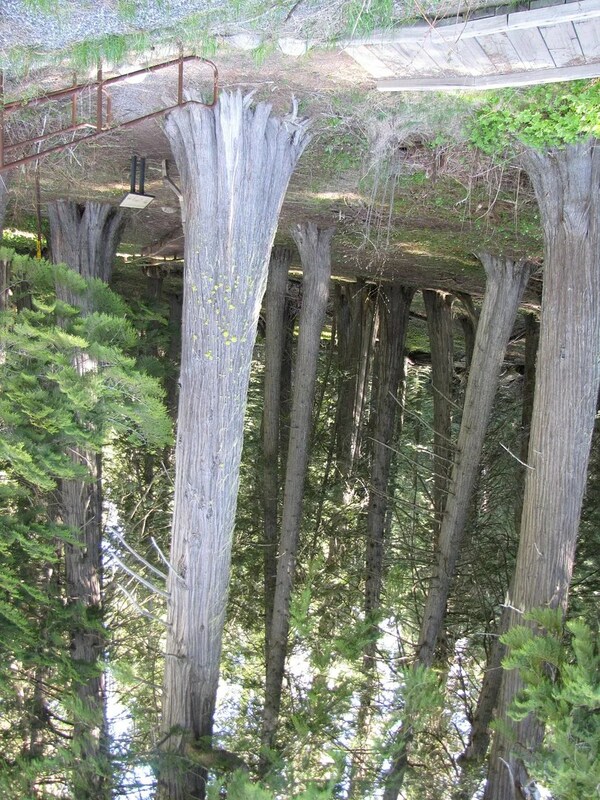 Da trees stay tilting. ROFL. Whitehouse Pond again. 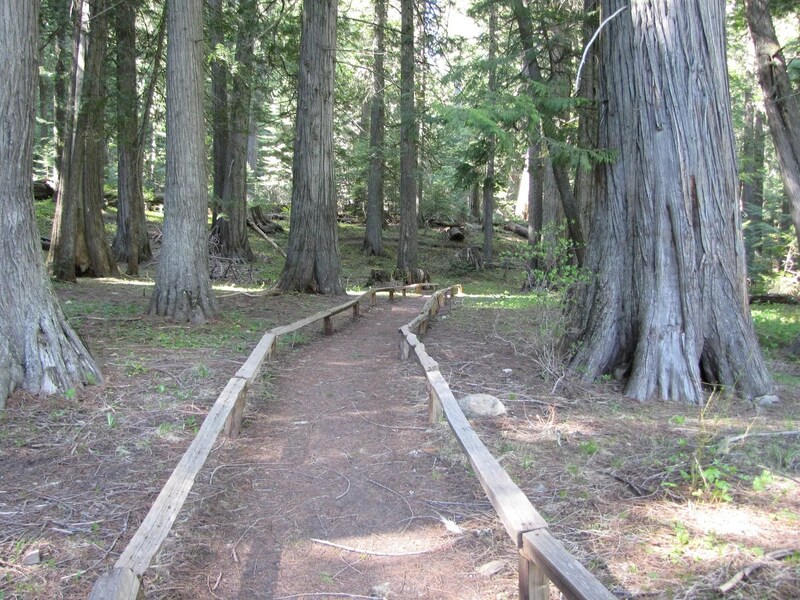 Now imagine yourself trying to blaze a trail through this. But take out the road first. 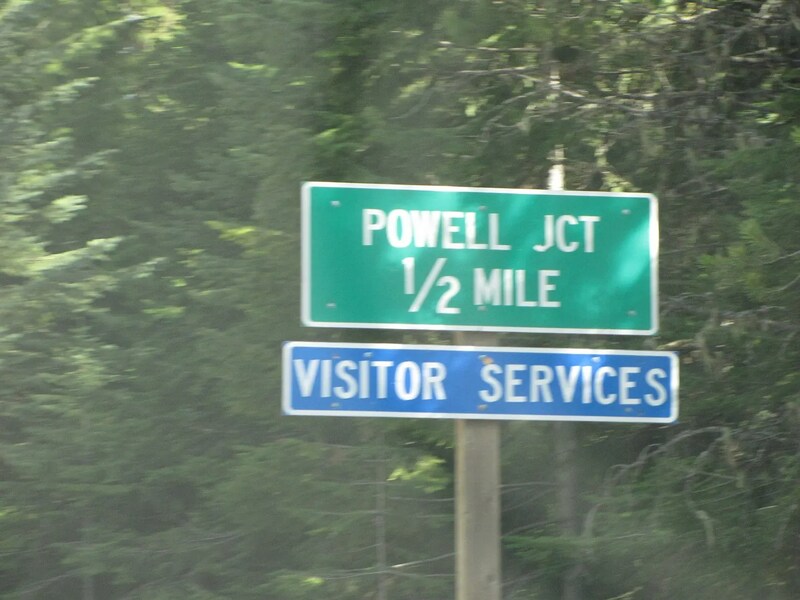 Powell Junction. I wonder what’s there. Nope! Still here da river! Oh! I hope we see something! I see nothing. Well, that’s not true. 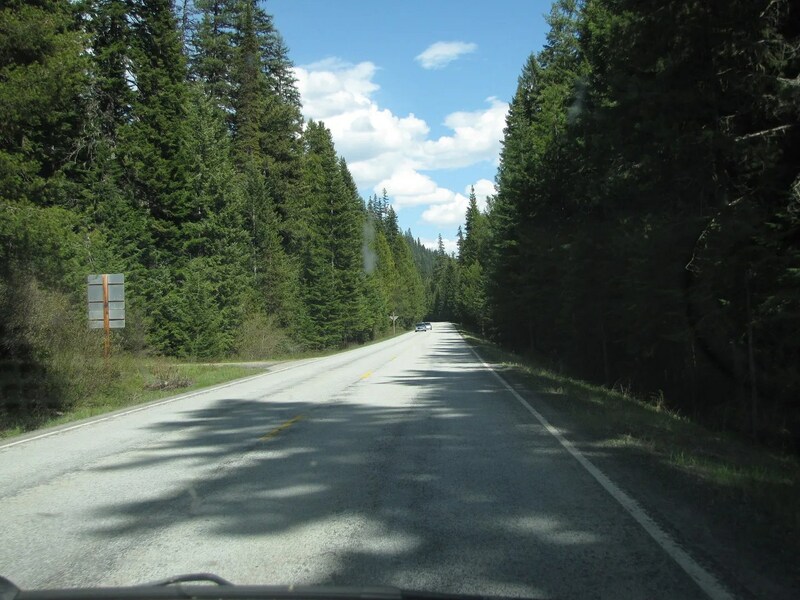 I see highway and trees, but no wildlife. But try wait! This is something unexpected!! 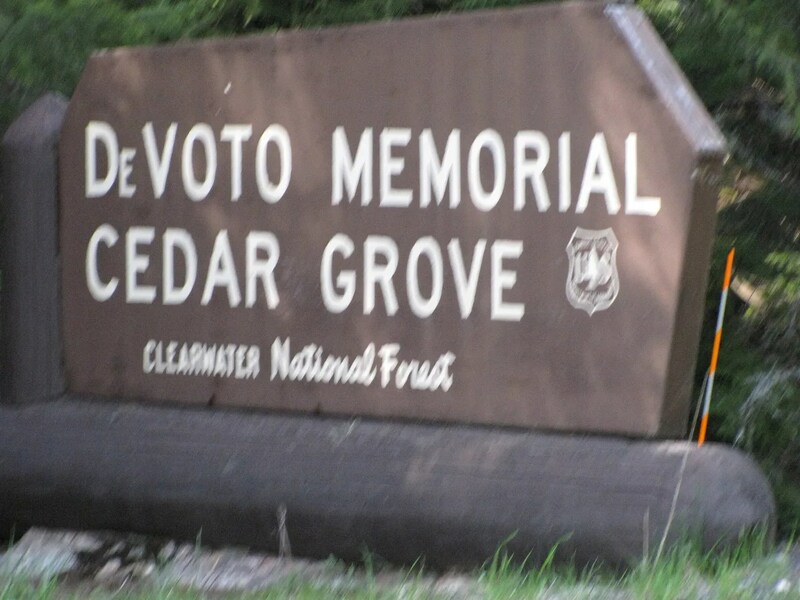 We’d been driving for a long time, and who knew when we’d be back this way again, so Nolemana and I decided to get out and look at the cedar grove. Besides, stay soa my ʻōkole! 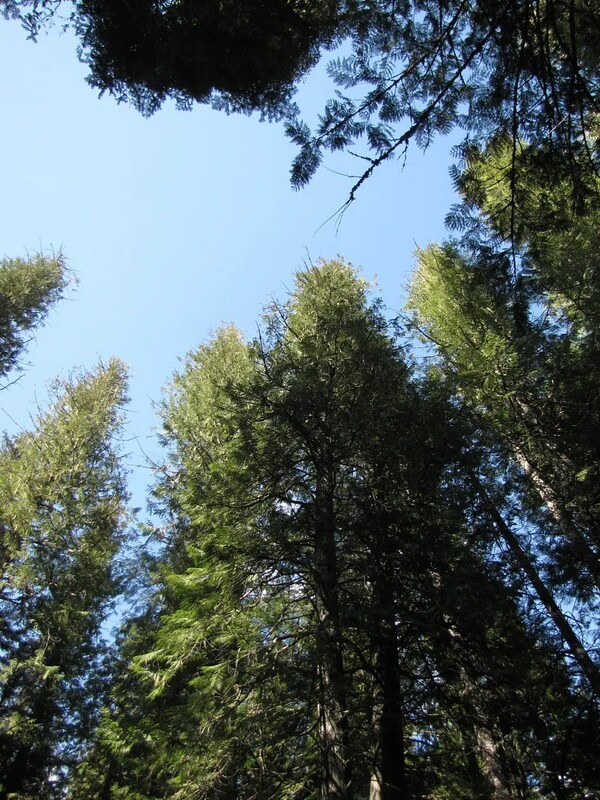 There were lots of trees reaching up to the sky. 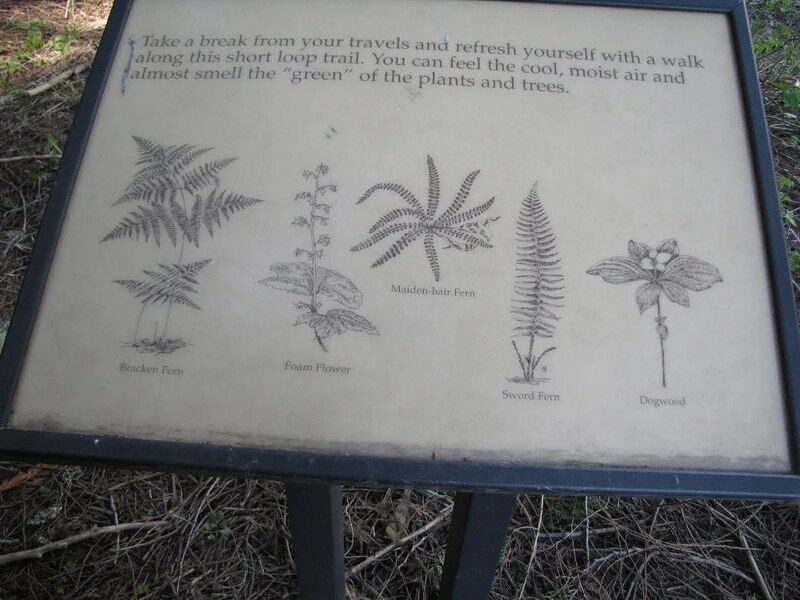 The sign shows all kine different ferns. 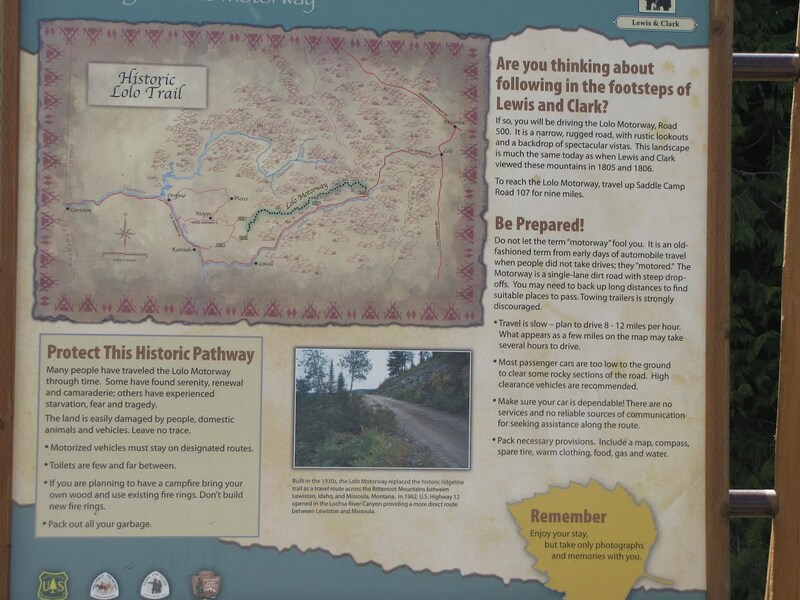 And this sign shows the loop trail through the forest. 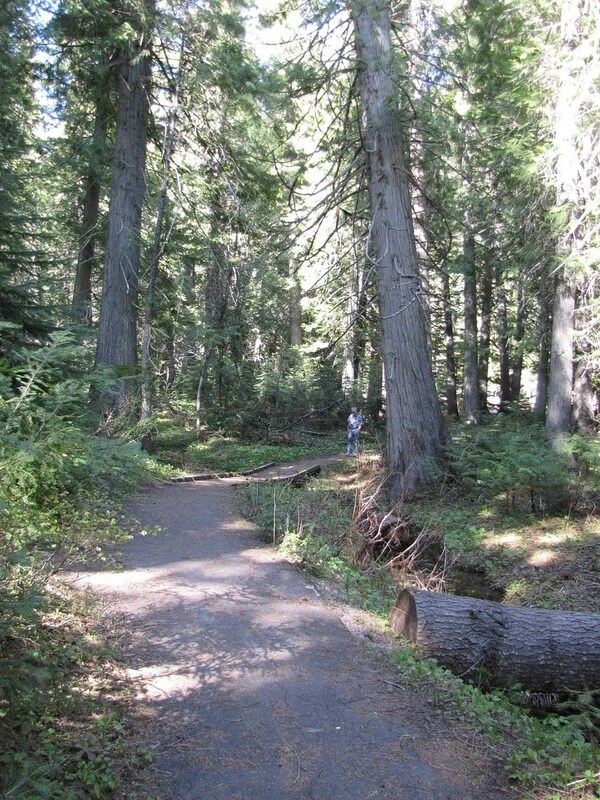 And here’s the trail through the cedars. And the sign was right. It was cool and refreshing, and oh, so nani! 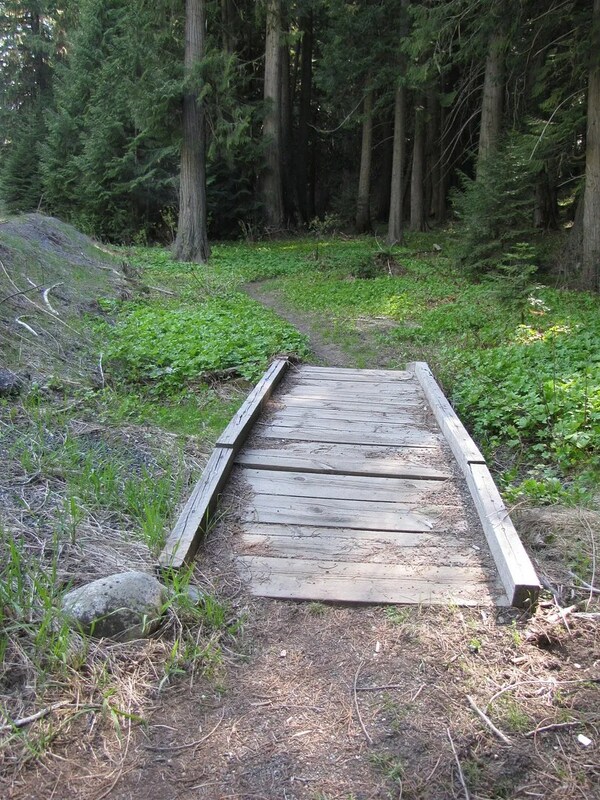 Bridge over a small creek. I was so happy we’d decided to stop. It was so beautiful here. Wow. I didn’t know this. 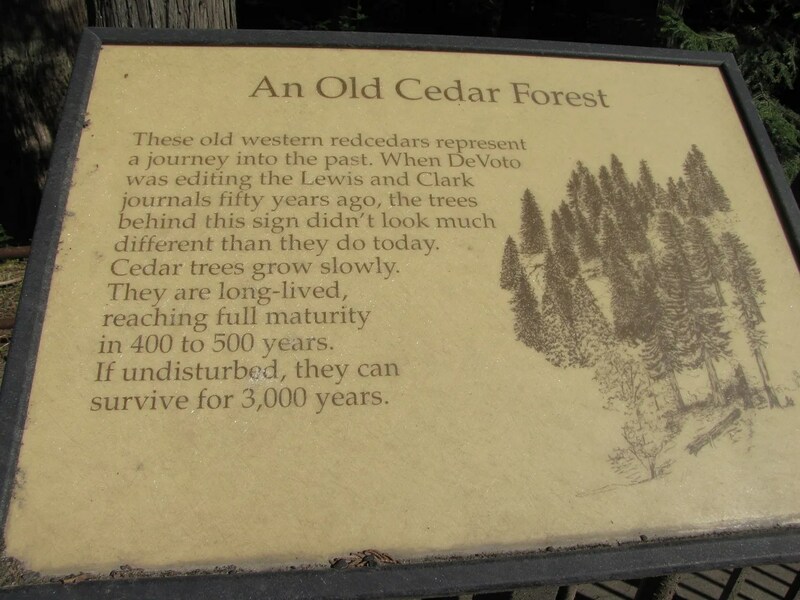 There are lots of cedar trees around here, but I didn’t know how long they could live. 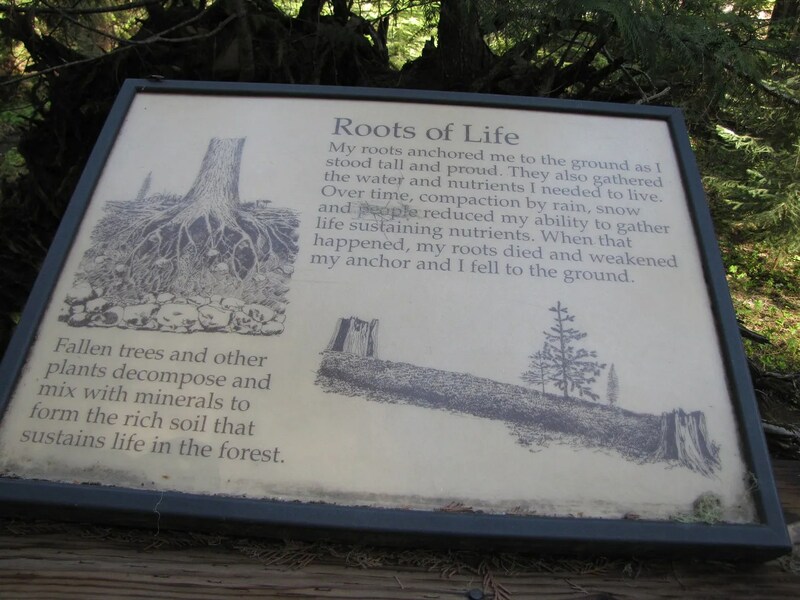 The sign says that the trees in the grove don’t look much different than when Lewis and Clark were here because they grow so slowly, and that they reach full maturity in 400-500 years!! And that if left undisturbed they can live for 3000 years! I had no idea! I love the look of old and almost brand new growth. I hope you’re not getting bored yet! I know this post has plenny photos, but I didn’t want to split up this part of the adventure. 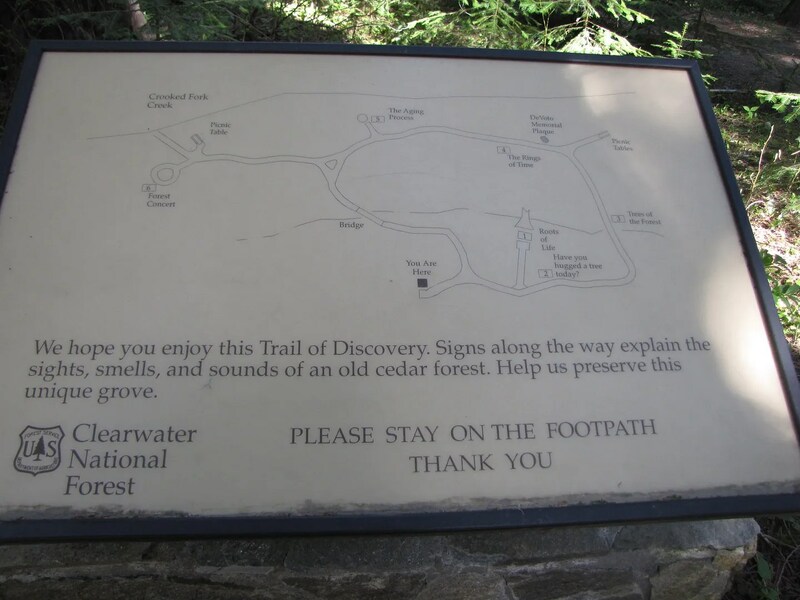 The grove was filled with explanatory signs and pathways that encouraged us to keep exploring. Guess what? 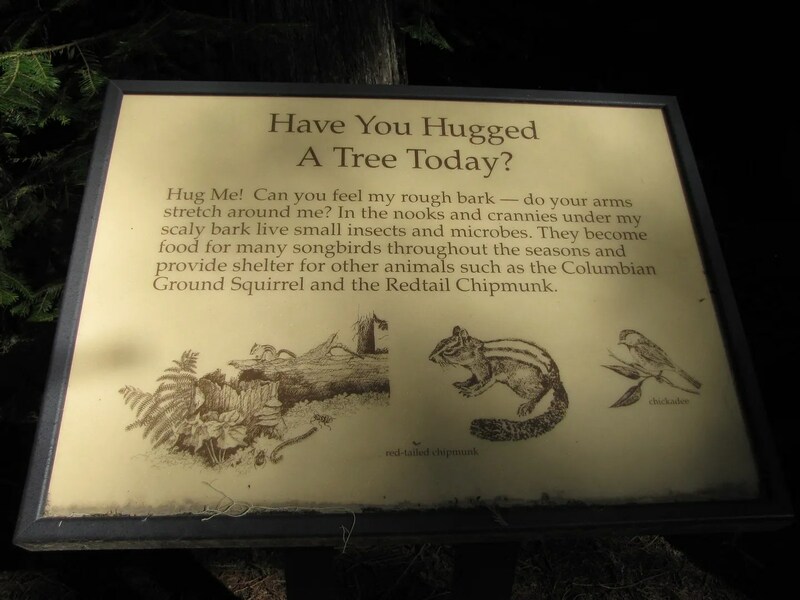 I did hug the tree! Of course you knew I would, didn’t you? 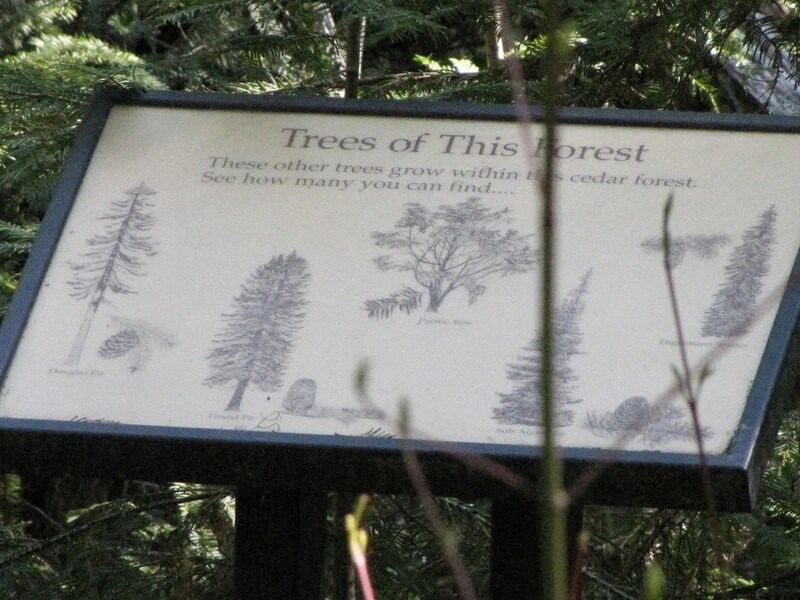 I loved that the signs helped to interpret what we were seeing, and to encourage to look deeper than we might have. Oops. Poor tree. 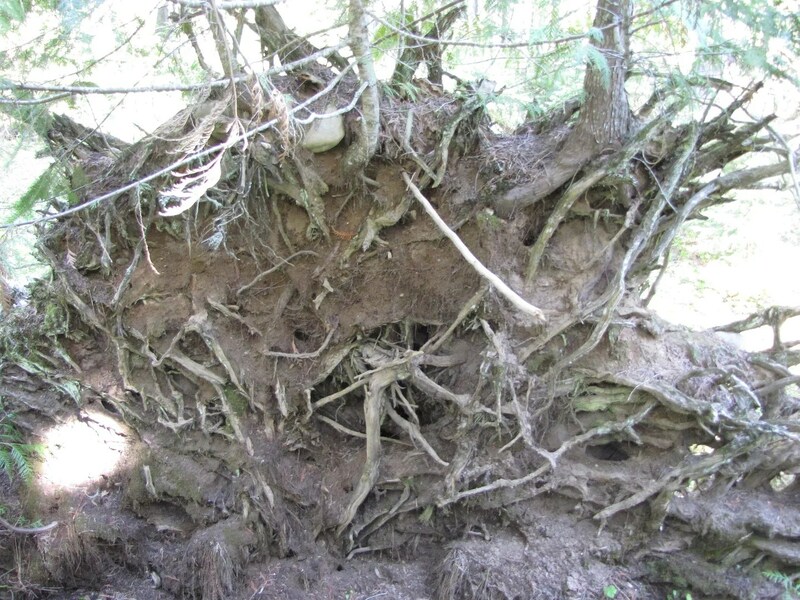 I know that cedars have really shallow roots, but I’d never seen them like this before. 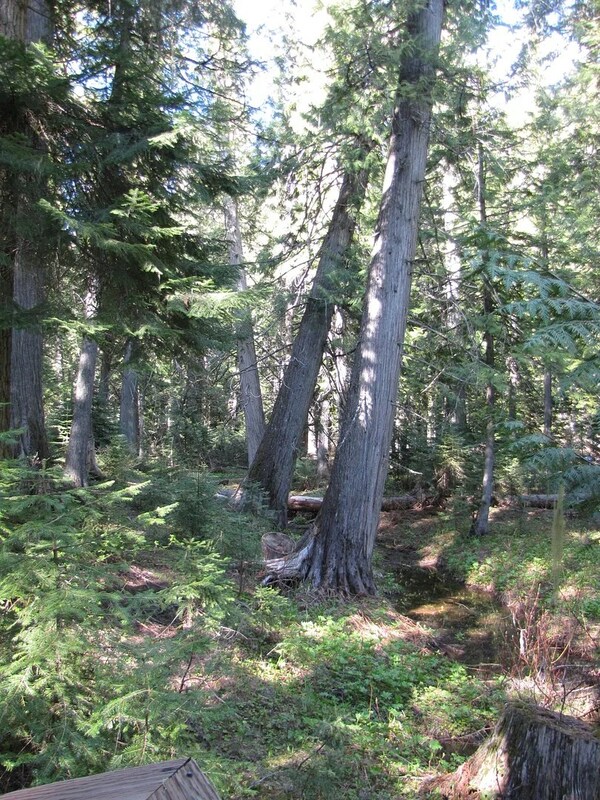 But it’s helping to make the forest floor richer. And that’s good. Part of the cycle of life and death. 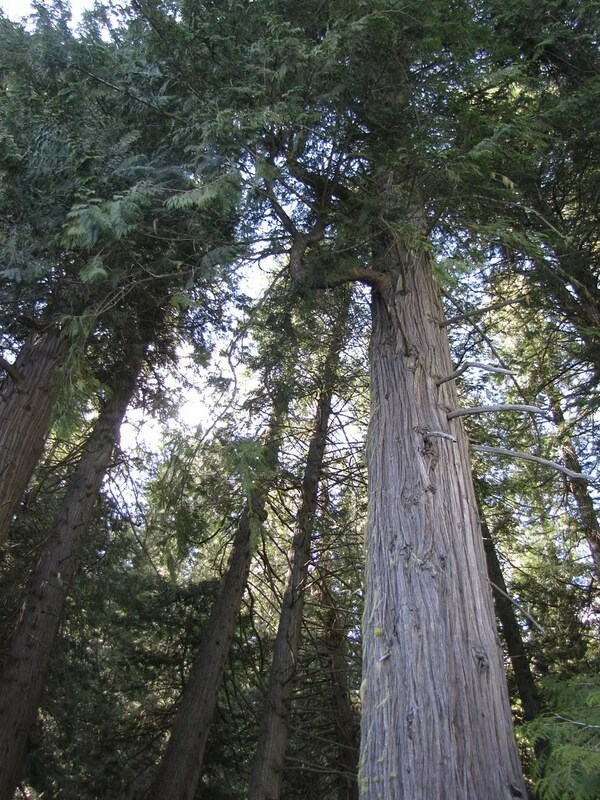 There aren’t just cedars in the forest. 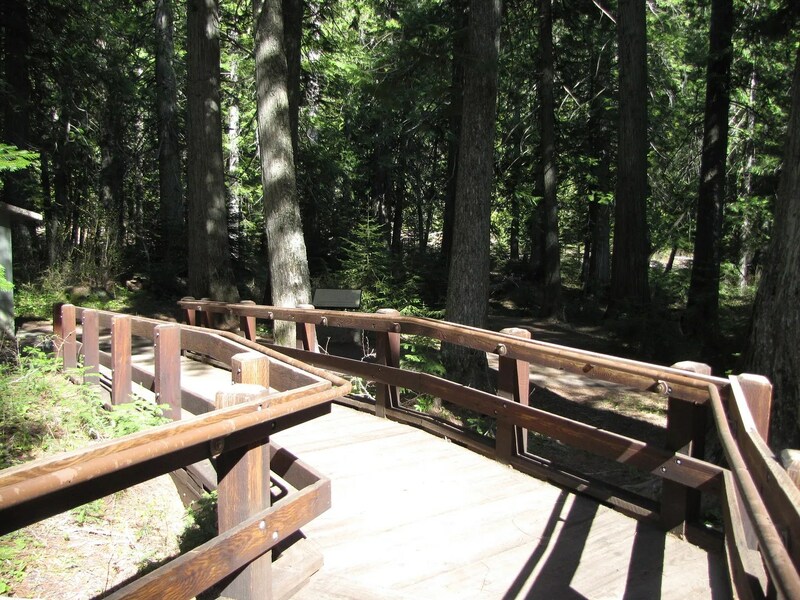 The path led down to the river. Nolemana took his camera and wandered down there. Another path down to the river. 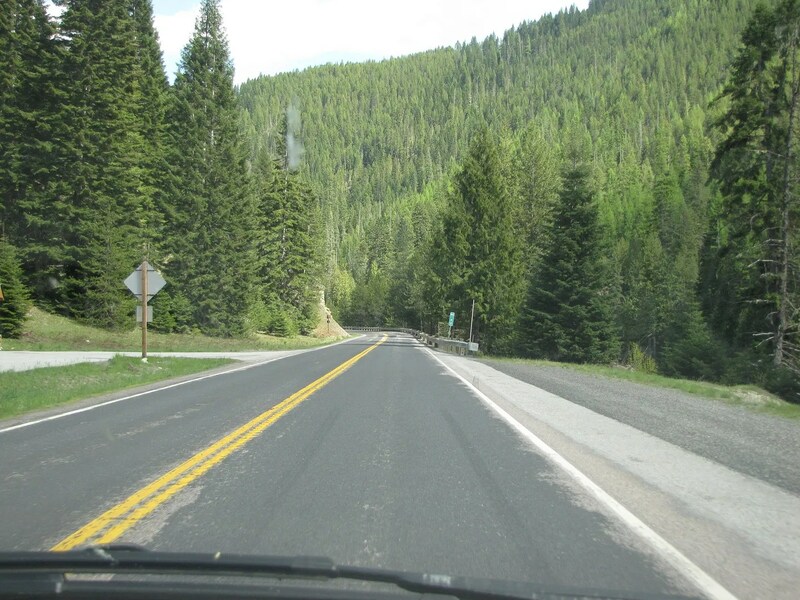 I took a photo of Nolemana on his way back. He took this photo. I love it. But all too soon, it was time to leave. 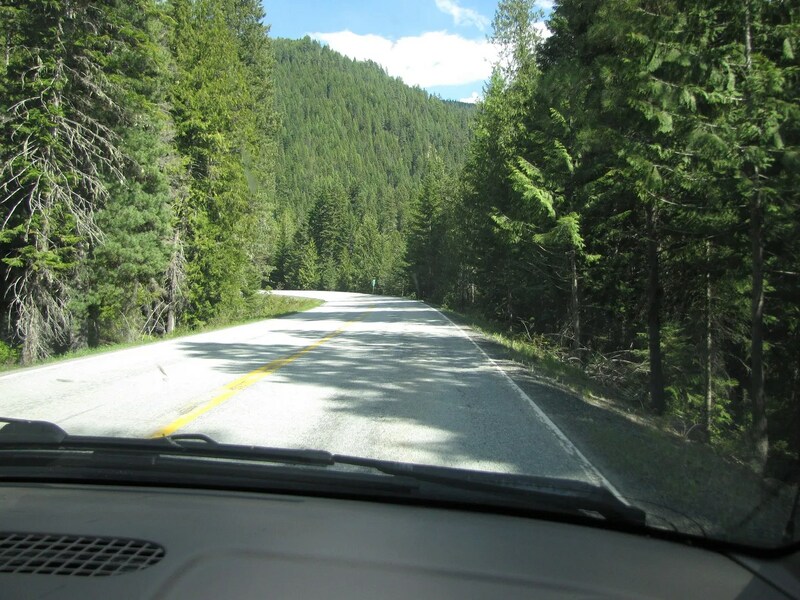 We had to get all the way to Bozeman, and we hadn’t even gotten to Missoula yet. Or Lolo. Heh heh. As we left, we could see the mountains through the trees. That’s where we’ll be heading on the next part of da adventure. As always, mahalo plenny for riding shotgun with us! Loving the drive! 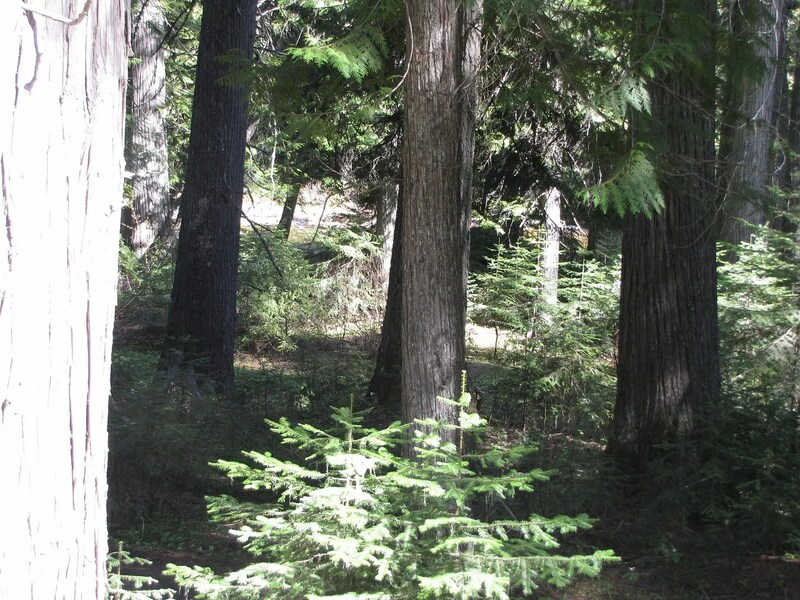 And I liked our stroll through the trees too.